With the first season of Colors’ 24 drawing to a close this weekend (21 December 2013), the channel is all set to bring in some programming changes. Both Uttaran and Bani – Ishq Da Kalma that used to air four days a week will beam five days a week with 24 shutting, every Monday to Friday, from the coming week. “Yes, we will be airing five days a week now,” confirmed Tina Dutta better known as Meethi of Uttaran (FilmFarm India). What about the janta’s favourite show Comedy Nights With Kapil? Well, Comedy … too will air twice a week from the first week of January next year. Coming Saturday, though 24 will be a thing of past by then, Comedy will not tickle the masses as that day will see many hour long finale episode of Bigg Boss 7. We’ll keep updating you on other changes!!! Here’s the best-kept secret in Bollywood. Anil Kapoor loves to let the drinks flow during his parties. But he doesn’t touch a drop himself. He then proceeded to ply all those present with drinks while Anil himself didn’t touch a drop. However everyone presumed Anil was sozzled to the gills. “He danced to My name is lakhan, screamed every guest’s name as though he or she were his long-lost best friend, pranced around with energy-level of kangaroo on steroids and made sure no one glass was empty. He was in his element all right,” says Richa Chadha an unabashed Anil Kapoor fan who showed up in a stunning black dress. Anil’s brothers Boney and Sanjay Kapoor also showed up to express solidarity. Strangely the wives of all three Kapoor brothers were missing. Maybe television is too infra-dig for the star-wives. Conspicuous by her absence at the party was Mandira Bedi who plays a pivotal role in 24. Well no matter what, the party was definitely rocking! Mumbai based actor and US returned Gaurav Bakshi is all set to enter 24, the popular show from Anil Kapoor Productions’ on Colors. With the show approaching its climax, the good looking actor will be seen in a cameo playing the character of Agent Kabir who will assist Kapoor in his final mission. “The entire team of 24 was thoroughly professional in their conduct and execution. The episode director Rensil D'Silva had the most wonderful temperament and was amazing to work with,” he shares. However, the icing on the cake for Gaurav was when Anil complimented him for his performance at the end of the schedule. “ ‘You have an absolutely fantastic screen presence; you will go a long way and I wish you all the very best,’ Anil ji said,” recalls Gaurav. Gaurav, who is an MBA from Georgia State University, had spent his early years in Atlanta (US) where along with a corporate career, he was seen and appreciated in local theatre. Gaurav will be seen in tomorrow’s (30 November) episode. Colors’ espionage thriller ‘24’ started off with lot of promise but later went on to lose fizz on the way. We are not really sure at this point of time how many television lovers are actually watching the show given its not so encouraging ratings week after week. Anyways, the show still has time before it ends and viewers are yet to witness a lot of drama. The series has lot of characters, some major others minor, and to give the plot the necessary push the makers have roped in veteran actor Shiv Subrahmanyam. Shiv’s last prominent stint on television was in Colors’ Mukti Bandhan wherein he played a business tycoon. In 24, he will be seen as Major Sood, a member of the ATU team. As seen so far, Jay Singh Rathore (Anil Kapoor) has broken a lot of rules at the ATU. Thus, Major Sood comes to put things in place. Shiv will be seen in four to five episodes of this series. 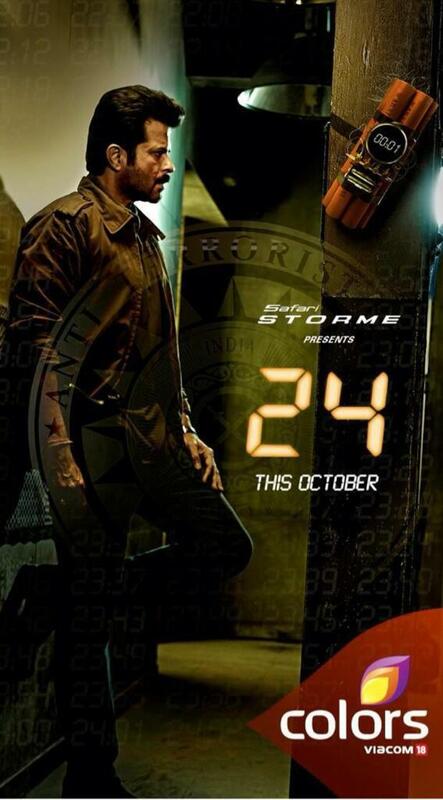 “Yes, I am a part of 24 and my character is of a Major who believes in adhering to rules and regulations. On the other hand, Rathore has been breaking all of them,” said the actor. The actor has already finished shooting for the scenes and has got busy with his film shoot. “I am a part of Two States where I play the lead’s father,” averred the artist. Shiv’s entry will be aired sometime next week. Colors’ acclaimed show the Indian adaptation of the hit international series 24 is making waves across the country. The show, backed by a stellar cast has already introduced Bollywood stars like Anil Kapoor and Anupam Kher and is now set to bring three more popular faces from the film industry in its upcoming episodes. In this week’s episodes, the audiences will see the much awaited entries of celebrated actress Shabana Azami, popular actor Rahul Khanna and award-winning actress Richa Chadda. While Richa Chadda will be seen a struggling actress- Sapna who is forced to helps Jai Sigh Rathod to escape, cult actor Rahul Khanna will be seen essaying the role of Tarun Khosla- a serious investment banker with a mission and Shabana Azami will be seen playing the role of Abhilasha Grewal who will be seen replacing Jai Singh Rathod as the ATU chief. While on the show the audiences have seen Jai Singh Rathod torn between the love for his family and country as he struggles to save his wife and daughter from the kidnappers and at the same time avert Prime Ministerial candidate, Aditya Singhania’s assassination, in this week’s episode they will see him escape from the power plant where he is under arrest of security agent Farooqui. As Jai successfully escapes from there he sees, a struggling actress, Sapna (Richa Chadda) sitting in a parked car. He points his gun at her and orders her to drive to a construction site where they take refuge. At the construction site, Jai finds himself in a situation where his fate lies solely in Sapna’s hands. All is left to find out which role suits Sapna more – hero or villain? Rahul Khanna and Shabana Azmi’s character will be introduced in the following episode. So far in the show, it has been shown that ATU officer Jiah is the spy and has exchanged several emails with Yakub- the kidnapper and the man behind Aditya Singhania’s assassination. In this week’s episode, while tracking Jiah’s emails Tej will find an encrypted email that will lead them to Tarun Khosla (Rahul Khanna)- an investment banker. Meanwhile in the ATU office, Abhilasha Grewal (Shabana Azmi)- a stern RAW officer will take Jai Singh Rathod’s place as the ATU Chief. What purpose does Tarun Khosla has and what twist will his and Abhilasha’s entry lead to on the show, is something that the audiences will have to wait and watch. Anil Kapoor's 24 garnered praises from Hollywood! Based on the American series of the same name, Anil Kapoor’s 24, has been garnering praises not only from Indian audience, industry members, family-friends or senior actors, but Hollywood has also been appreciating 24 to the core. Anil Kapoor’ co-star and friend Tom Cruise of Mission Impossible has reportedly appeared as a helping hand for him when Anil was preparing for the role of Jai Singh Rathore, ATU chief in Indian version of 24. Cruise has also made his support public through a tweet, saying, “Follow the Man.” This is not it, Kiefer Sutherland, who played the original Jack Bauer in 24, has extended his congratulations on the show's big launch. Written by Rensil D'Silva, Bhavani Iyer and Priya Pinto, directed by Abhinay Deo and produced by Anil Kapoor Films, the show airs on Colors channel. Jai comes to the ATU and asks Nikita to get the dead body analysed. He informs that he is following yet another lead of Jhanvi which might inform him about Kiran. When Tej gets to know about it, he creates a scene saying Jai is breaking the protocols one after the other. Nikita asks him to stop being so critical of Jai. Tej replies that he is doing everything for him and Nikita. Nikita asks him to back off and not do anything. Jai reaches hospital and meets Trisha and Abhay. He asks what type of a father Abhay is, considering he does not even know the boys Jhanvi went out with. Abhay counters that the same applies to Jai also. Trisha asks both of them especially Jai to calm down as Abhay has been supporting her in her quest throughout the night. Jai phones Nikita to get the dead body analysis done and permits her to bring Mihir for decoding the card. Jia is against this practice but on Nikita s insistence agrees. KK comes to meet Naina where Naina asks him about how Mehek got to know about the fiasco. KK informs that he and Naina would not spill the beans and that Aditya only knew a part of the secret which means it was Prithvi who becomes the natural suspect! Naina says it does not matter how it happened but now they would have to find a solution to the problem. KK asks her to be relaxed and says that he knows how to keep her silent. Naina says that it would not be so easy to keep her silent because she is a strong personality and is not afraid of anything. If anything can be done, Mehek s weakness should be found out and targeted. KK says he has understood and that he will do it soon. While KK is leaving, Aditya catches a glimpse of him and is shocked. ON the other hand, while leaving KK meets Megha Singhania the aunt of Aditya and the mother of Prithvi. Jhanvi is brought to the hospital where the nurse refuses to admit her without FIR but senior doctor admits at his responsibility taking her to OT..abhay and trisha reach hospital and ask the nurse about the girls.. she identifies jhanvi..Trisha gets call from Jai and narrates the entire incident from kiron calling, to being stopped by traffic police, to getting to know about jhanvi being in hospital.. Jai asks her about what was the location kiron mentioned and also about Jhanvi's condition and if she's in a position to speak.. Trisha informs that she isn't a doctor and that jhanvi is being operated, her daughter is missing and he's busy with office.. Jai tells he'll find Kiron at any cost and says he's coming to hospital..
Dev lies to yakub about Jhanvi being dead.. they follow yakub..Divya is having her checkup.. Doc asks her if she had an abortion? divya confirms 6 months back for party campaign.. Doc says its complicated because of that only and prescribes certain medicines..Jai calls nikita to inform about going to police station to interrogate the Parvez.. nikita informs him about Gill..Jai reaches police station and requests inspector about interrogating when Gill arrives asking them not to and accuses him of killing wasim..Jai says wasim was his friend and that right now its aditya who's life is in danger.. Gill says he'll interrogate..
Rohit asks Dev if they'll kill kiron?? Dev says yakub never spares anyone..kiron sees the same man whom she had asked to help and tries showing her condition when yakub stops her and later puts her in the boot..jai calls up trisha asking her to make sure no one speaks to jhanvi when she asks him to come.. Gill comes informing that he said he would speak to jai only.. jai asks him about kiron when he asks Jai to get him to VT station telephone booth in 20 mins or he would never see his daughter..
aditya calls up mehek saying he wants to meet her.. she comes to hotel and asks him about the incident when he says he was never involved and asks about source.. mehek says she wouldn't name but for sure its someone close to him and asks if he'll give statement?? aditya says he would to the public.. mehek leaves asking him to keep his TV on..
Jai starts assaulting Parvez when police and gill come to stop him.. jai secretly gets the cell key and gives him.. they decide to take a break while jai calls nikita asking her to trace the booth on VT station.. they escape..Aditya and his BIL have an argument for divya.. at police station they get to know about Parvez and Jai missing and gill calls nikita asking her to trace Jai's car.. she informs him about moving towards VT and secretly calls Jai to inform the same..
At VT station Jai brings him to booth when they find a mobile phone and car key..yakub calls on mobile telling about change in plan and to find a blue car which has a dead body which they need to hide.. jai and Parvez reach and Jai checks on the body.. Gill arrives with police and asks them to take Jai away when Jai tells him about someone from ATU being a part of all this.. Gill doesn't believe first but then agrees to help.. Gill takes parvez while Jai heads with the body and asks nikita to get best forensic doctors..
Jai informs trisha about kiron being kidnapped by those who want to assassinate Aditya.. Yakub instructs Jai to sit in a car..
From the files on the SD card Nikita figures out the name and address of a man called Pervez who is linked with this plan. At that moment, Gill comes and takes over the charge of the ATU. Jai leaves by the secret exit. Gill searches for him and asks Nikita time and again who denies knowing anything. Nikita is shocked to know that Tej was the one who informed RAW. She says that Tej has lost his credibility in her eyes. Gill asks Tej to prepare the list of all the employees and asks all the employees to give every single detail of Jai in the past 24 hours. Nikita warns Tia against divulging details of her work to Gill. Trisha and Abhay while driving are stopped by a policeman for not having the papers and license who hurls abuses at them and insults them even after knowing about Jhanvi and Kiran. Kiran goes past them but they fail to notice. After heavily bribing the inspector, they get to leave. On the other hand, Kiran pleads Dev to go back as Jhanvi might be alive. Knowing this, Rohit realises that Jhanvi might be alive and she might identify them. Hence he leaves with his revolver to shoot Jhanvi. Just as he is about to shoot Jhanvi, an ambulance comes and takes her away. Abhay and Trisha reach PNL Shipping but fail to find the girls. They see a vagabond who informs them about Jhanvi being taken away in an ambulance. Jai nails down Perevz with the help of a police inspector who himself dies in that endeavour. Pervez warns Jai against jailing him or Kiran will be hurt. Abhay confronts Nandini that she knew about the incident and wilfully covered it up with force. She confesses that she was unaware of KKs methods. On learning about Mehek Ahuja she says that she will get her taken care of by KK. However Aditya tells he will say the truth despite Nandinis reservations.Aditya is baffled by Divyas pain and forces her to see a gynaecologist. Kiran is taken to Yakub. Rohit lies that Jhanvi is dead. Meher lands and meets Shaina. Shaina burns the clothes and accessories but keeps Max ID card for herself. Meher leaves in a car as Yakub is waiting for her. Trisha is searching recklessly for Kiran along with Vikram. They reach the party in Aramnagar and search for the two but their attempts end futile. Yakub pays Meher the amount and asks for the ID. Meher says that her sister Shaina will bring it. Yakub says that this was not there in the plan. Meher confesses that she made some alterations in the plan. Shaina comes and demands that they should be paid in crores and not lakhs for this extremely important job and thus the fee should be doubled. The assassin who has acquired Max' face hears the conversation and practices shooting. Wasim arrives at a cinema hall screening a flop film and buys a balcony ticket. He meets Sahil, his informer there. Sahil informs that over the past few months, he has learnt about various emails and other facts that led him to believe that there was a traitor in the ATU unit. He hands a SD card to Wasim which supposedly contains information about the planned assassination and also about the traitor. Sahil informs that he will leave for Delhi soon, in order to save himself. Just as they are about to leave some men shoot Sahil and injure Wasim as a bullet scrapes past his arm. Back in the ATU office Jay and Nikita are discussing the plane crash and Jay is sure that this is linked to the assassination. Tej overhears them and tries to chip in. Jay asks him whether he has learnt something about the threats that Singhania family has received over the past few months. Jai gets to know about Kiran being missing and calls Trisha. Trisha disconnects halfway. Jay phones Pradhan to inform him that he should be more cautious from now on. Pradhan informs him that all new guests will be screened pre entry and all existing guests will have their details scanned. Jay gets a call from Wasim at the same time that informs him about his condition. He leaves for the theater at once. Trisha finds out that Kiran and Jhanvi left with Rohit and Dev, the former being the son of the caretaker of Sun Villa. She phones Jay to get some more information but fails to reach him. She calls at the landline and Nikita receives her call. Knowing the gravity of situation Nikita helps her by giving her contact details of the caretaker. Jay sees the man dead at the box office and predicts something horrible has happened. He goes inside and finds out Wasim. Wasim tells him about the situation. They both try to run away and encounter many shooters on the way whom they deal with deftly. However while reaching the door near the screen, Wasim gets shot. He gives the card to Jay and asks him to run away. Jay phones his office and gets the details of the SD card transferred to his office computer. The lady informs him that she could not read the data but could figure it out on which computer it was first used. Aditya calls Prithvi and asks him about the graduation night incident. Prithvi says that it was just a minor event in which Aditya hit a guy who was misbehaving with a girl. Aditya asks him if he knew that the boy died. Prithvi confirms his suspicion and tells that Nandini ordered him to do so. He argues that media would have spoilt his image and made him a murderer despite him being innocent. Aditya claims that a murder is a murder. He spills the beans that Mehak Ahuja now knows about it. Aditya is sad on hearing about the news of crash and says that how long will terrorism ruin our lives. Nandini advises her to use this in the speech to earn brownie points and also mention the murder of Pratap. Aditya refuses to do so saying he is not here for political gimmicks. Kiran pleads Dev to take Jhanvi to a doctor as she was strangled by Rohit. They stop the car. kiran comforts Jhanvi. Rohit tortures Jhanvi and asks Kiran to call her mother and inform that everything is alright. He misbehaves with her. Kiran phones Trisha and assures her that she is alright though Kiran notices the suspicion in her voice when she says ILU to her. She says that Jhanvi and her left for a ride. Prithvi asks Aditya to get down by using the fire exit as there will be strict security everywhere else. Aditya comes down and meets him. Precap: Kiran and Jhanvi run away while people at the hotel realise that Aditya is missing. Aditya advises a few rowdy guys to make good use of their anger. Aditya decides that he will confess in front of everyone. Nandini is furious and says that he is going to commit a political suicide. Aditya replies that no one can stop him now. The episode starts in Jai Singh Rathore's (Anil Kapoor's) Voice talking about terrorism and the attacks on India especially the Mumbai blast 2008 post which a new organisation called ATU (Anti Terrorist Unit) was formed.. Jai is the head of ATU. Background voice that Aditya Singhania has been selected for PM post.. A man in Thailand is watching Aditya's speech on TV while having his dinner when he gets a call from Yakula asking where he is?? The man says he was watching Aditya's speech with friend's and asks if he should be killed?? Yaku asks him to leave to airport as if work doesn't get finished on time then they'll just finish him off.. they hang up.. The man thanks them for dinner especially a doctor who helped in getting a new face.. he leaves and we see 4 people dead on the table..
Its trisha's birthday.. he and kiran wish her when she gets emotional and says that she never thought they would celebrate anything together after he left.. Jai promises that he wouldn't break the promise he made to her ever.. Veer calls to wish when Jai gets calls from Nikita asking him to come over as Gill is coming from RAW to brief them and he's insisted on Jai being present.. Jai tries to avoid saying its trisha's B'day but then later agrees..
Trisha asks about the call when Jai says he needs to head to the headquarters..kiron tries stopping but in vein.. Jai leaves.. Kiron also leaves to her room.. Trisha is left alone with her cake..
Aditya in his private jet sleeping.. his BIL Vikram is asking for another drink which the airhostess informs Divya.. Divya comes to Vikram and tells he isn't getting a another drink as its special for her brother tomorrow but he blabbers on and says he'll stop only if he gets another drink.. Divya giving up asks the hostess to make a final drink for him.. she leaves crying and comes to her mom who taunts her about Vikram..
Jai is leaving when he comes to kiran apologizing but she isn't ready to listen as he's broken his promise..Jai leaves..
Back in the Jet Aditya wakes up and Pritvi his cousin shows his magazines with pic as cover and has a talk with him about Bollywood heroines thinking him to be the hottest person but this doesn't go down well with his mom..Jet lands..
Kiron upset calls her friend Jhavni asking to pick her up as she's coming for the party.. Jai gets a call from Wasim who informs him about someone wanting to shoot Aditya become he becomes PM.. Wasim says he's got some info which even Gill doesn't have and that he just wanted to inform Jai that there is someone within ATU who's helping in this Assasination of Aditya.. Jai asks about proof when Wasim says he's going to get that only and asks Jai not to believe anyone till then..
Kiron leaves with her friend without informing Trisha.. Trisha gets to know of this when she hears the car horn..Jai reaches, when Trisha calls up saying Kiron left home and isn't answering her phone.. Jai calls Kiron but she switches off her phone..
12. 15 AM jai reaches ATU office when nikita tells him that an hour ago they got a call informing that someone from Thailand is coming to assassin a big politician and she and tej assume it to be Aditya.. tej gives him Aditya's itenary and leaves.. Jai asks nikita for help.. he asks her to hack kiron's email to find out where she is.. nikita doesn't agree at first but later does..
TV news about Jai reaching Mumbai.. Jai and family reach home and seeing Vikram's behaviour Divya apologizes and gets emotional but Jai asks her to pep up as she's his strength and that its not a day to break down..
Nikita comes to Tej asking about a code when Tej asks her if she still loves Jai as she trying to hack something for him for which she needs code.. Nikita says she's over with Jay and that they are together when he asks her if she's informing or confirming.. Nikita gets angry and asks orders him as his Senior that she needs the code right now and leaves..
Pradhan informs Pritvi that security arrangements are done.. Pritvi asks pradhan to tell him and only him if he has any doubt about anything.. The man (Max) has boarded flight and is going through some pictures when meher who's next to him asks if he's a photographer and praises his work.. Max calls up pooja asking her for his ID password which she tells him which he repeats as well making meher listen to it.. pooja asks him to contact pradhan for anything that he requires.. Max thanks her as for the first time he's gonna shoot a PM..
Aditya doesn't want his speech to be changed and asks pooja not to make any changes on the same.. Pooja informs about Max when Aditya questions.. His mom informs that she only hired him and that he'll be clicking him up till the swearing in ceremony.. Kiron reaches party, has a shot with jhanvi and then leaves with jhanvi's friend rohit for a long drive.. Nikita cracks up kiron's account and Jai informs trisha about the party place..
Gill arrives and asks Jai to come to Conference room and also to address him as Sir..Abhay Jhanvi's dad calls up kiron's residence to ask about jhanvi when trisha informs about the party and that kiron also left without telling.. she asks if he could pick her up as she's also getting restless.. he agrees..
Gill informs them all that a professional shooter from Thailand has been hired to assassin Aditya and that they don't have much time.. he asks them to get going with the case and that he's gonna be heading it with everyone including Jai to report to him on anything and everything.. Gill says he needs to talk to Jai in private and comes to his room and hands him a flash drive from which he can hack any confidential information.. Jai asks him about the informer who gave him the news but he doesn't tell.. He asks for coffee and Jai leaves to get an injection while nikita is trying to stop him.. Jai tells that Gill has information but he isn't giving just to take credit and leaves.. Jai comes back to Gill and asks for the informer again but when Gill refuses her injects him informing that this injection will lead to heart attack and that Gill wont get the antidote unless he tells about his informer..
Jai starts countdown and gill without option tells that its Vicky.. Jai asks nitika to get Vicky's file ready..gill asks for antidote when jai says it was only glucose and that its his old method of interrogation.. he asks gill to leave..
kiron sees her phone and finds messages from her mom and wants to go back but rohit doesn't.. kiron and jhanvi trapped.. trisha leaves with abhay.. she calls up jay to inform she heading to find them when jai says he's just leaving and she needn't go but trisha says she's already left..
aditya is having a talk with his mom about the speech and promises he's gonna make when pooja comes informing that mehak from WNCC news wants to speak to him.. aditya takes the phone and leaves when mehak tells that she's followed his journey till date and was impressed until she found out about a 12 year old graduation party truth..Aditya asks what she's talking about when she says she's got proof about him killing a man that day..
meher and max head to lavatory where she first gets intimate with him but later kills him and leaves taking his card.. a hostess comes asking her to get back to her seat when she kills her also and leaves her in the lavatory.. meher changes and takes out her parachute from her hand luggage, blasts opens the flight door and leaves.. she fixes a bomb from the extinguisher on the flight.. it explodes..
wasim informs Jai that he's got information but he couldn't save the one who gave him information.. jai gets an SD card and is seen firing as well.. he sends the SD card info to someone asking her to inform from which laptop its been sent.. the girl decodes it and Jai tells that its someone from ATU only..
Pradhan informs Aditya's family that Aditya's life is in danger as per news from intelligence..he tells that Aditya left without informing..
here Kiron is trying to free herself and Jhanvi but they assault Jhanvi.. Kiron is made to call her mom and she tells that she's with a friend on a long drive..
24 - Guaranteed thrill and entertainment! Just two episodes old and 24 guarantees edge of the seat entertainment and something new to Indian Television programming! The story so far - Jai Singh Rathore (Anil Kapoor) is the head of the Anti Terrorist Unit set up in Mumbai. Shown to be a dedicated officer, the story set for 24 episodes with each episode to be showing the goings-on for one hour starts with Jai getting a birthday cake for his wife Trisha's (Tisca Chopra) birthday. They have a daughter Kiran (Sapna Pabbi) who too is part of the celebration while their son Veer too calls at midnight to wish his mom. Just before the cake cutting Jai gets a call and is called at office for an urgent assignment. He rushes off leaving behind a sad family, while Trisha looks upset, Kiran retaliates by going off to a midnight party with a friend without informing her parents. After a bad phase her parents are now attempting a patch-up which Kiran is desperately waiting for. Even as Jai is on his way, he receives a call from his friend Wasim Khan (Anupam Kher) who has news about a traitor in the ATU (Anti-Terrorist Unit). At Jai's office, his colleagues Nikita Rai (Mandira Bedi), Tej (Adheer Bhat) and others are waiting for him. During a quick meeting with the RAW chief the team is briefed about the assassination threat to the yet-to-be sworn-in Prime Minister of India, Aditya Singhania (Neil Bhoopalam) who is in Mumbai to address the nation on his father's death anniversary. Apparently, his father too was assassinated on the same day couple of years ago in Mumbai and his mother has plans to use the sympathy in his favour. Aditya is along with his entourage of his mother (Anita Raaj), sister and her husband, his cousin and his staff. Even as the Singhanias are gearing up for the next day, Aditya gets a call from a news channel head, Mehek Ahuja (Suchitra Pillai) who unearths a 12 year old secret where Aditya has been involved in an accidental death at his graduation party. Despite knowing about the threat to his life, Aditya takes off with his cousin to an undisclosed location without telling anyone! There is a parallel track running with the terrorist group making plans of killing Aditya and a plane carrying his official photographer Max is killed and the plane blown mid-air with the killer shown to be a young, attractive girl who saves herself in the nick of time as she ejects herself from the plane and lands to safety with the help of a parachute. The assassin has got plastic surgery done and now resembles the photographer. Meanwhile, Kiran and her friend Jahnavi are kidnapped again apparently by the terrorist gang while Kiran's mother and Jahnavi's father (played by Ajinkya Deo) go around looking for them. At the ATU office Jai gets an urgent call from Wasim who is injured while gathering evidence against the traitor. Jai rushes there and even as Wasim dies in the shoot-out, he hands over to Jai the evidence. Jai tries to find out who the traitor in his group is and the name of Nikita Rai who is shown to be earlier in love with Jai flashes on screen! While all these incidents are happening in different parts of the city at the same time, they all have a common thread and are connected to each other in some or the other way! Everything! The Indian story adaptation is perfect with the characters gelling well with the script and looking, behaving and dressing up like people do in actual real life. The pathos of a family living in an urban setting where work has to be given importance is shown brilliantly. The credit for the same goes to writer Rensil D'Silva. It is a seat clutching, nail biting drama minute after minute and you want to know what happens next with each shot coming in with a new and interesting twist! The Singhania family closely resembles the Gandhi family with the mother in charge, son who is a youth icon wanting to be a PM, the strong willed daughter who is married to a good for nothing husband however, the makers have always denied this but it looks like an open secret! We like the way they have shot the outdoors in Mumbai at night... the locations look real and so do the interiors - whether it is a plane, a house, a party, or a 5 star. The production values are extremely high and demanding. With so many parallel tracks running at the same time, the multi-screen imaging works wonders and doesn't distract you a bit. With an impressive star cast, there is no chance for a flaw when it comes to the acting department. While this is Anil Kapoor, the film star's debut on Indian Television, he manages to make an immediate impression on the audience. We can feel the pain in his heart as he sees his friend dying and has to leave everything behind when duty calls. Tisca despite her haggard and morose looks has something to say even in her slow movements. The rest of the cast including Anupam Kher, Mandira Bedi, Anita Raaj, Ajinkya Deo, Suchitra Pillai, Sapna Pubbi, are impressive too to say the least. While all these are known names a special mention of the girl who blows off the plane - she is not only a good looker but has a solid screen presence as an actor. The hard work behind the creative supervision of B.R. Sharan and Piyali Kar is noteworthy and actually they are the ones who should be congratulated for planning with such meticulous detail, and putting together such a foreign concept to make it work in India. Nothing actually... apart from a few bloopers that come to mind... If Anupam Kher is lying injured inside the cinema theater with 3-4 shooters inside the theatre, how does Anil Kapoor gain entry and reach all the way where he is lying injured so easily without getting shot at? Also when Anil Kapoor knows for sure that there is a traitor in his unit why does he forward the data to the girl from his office? What if she was or is the traitor? Why doesn't he wait to reach office and decode the data in front of his eyes rather than sending it out and depending on someone who might be the traitor? He actually asks for Nikita as he wants her to decode it but since she is not on her seat it is done by one of her colleagues who does the job for him and Nikita's name is seen flashing! How can he believe anyone from his office when one of them is a possible traitor or maybe there is a reason to it which we may come to know of in later episodes? 24 tele-series is a fast paced thriller and the one hour episode just speeds past with so much happening in it. The Indian audience which is used to slow paced drama being unnecessarily stretched for days on end will welcome this change of track. However, it does look to be urban centric with its presentation and while it will have the metro audience (especially youngsters) hooked onto it the same cannot be said for the audience from the interiors of our country who may still want to watch the never ending saas-bahu sagas every evening. So Anil Kapoor’s much anticipated ‘game changer’ 24 premiered last night on Colors television. Anil Kapoor’s name appears on the cast and as the producer. Howard Gordon’s appears as the executive producer. The first episode introduces central character of the story Jai, the Anti Terrorist Unit (ATU) agent, his wife Trisha and daughter Kiran. Then Aditya Singhania, the young Prime Minister whose swearing-in ceremony is due in 24 hrs, his family and the terrorists, planning his assassination. The story picks up from here and will be revolving around this plot for the rest of the season. The episode and the series is a patchwork of minutes from these people’s lives. The story’s protagonist Jai Singh Rathod (played by Anil) narrates the backdrop to the formation of ATU which he heads. The opening runs a montage of terrorist attacks in India, the Mumbai attack on 26/11 2008 being the motive force behind the formation of ATU. Since the episodes run in real time, it shows event between 12 and 1 am, the characters dealing with their things. Jai seems to be struggling to balance work and family, his family complaints about him prioritizing his work. He has to leave in the middle of Trisha’s birthday celebration because Gill, who is now his senior, is coming to brief the ATU crew. He has received a tip from RAW about the PM murder plot. Upset by Jai’s leaving the celeberation in between, Kiran leaves the house to party with a friend, without informing her mother which in turn sets Trisha on a mission to find her. On the other hand the terrorist who has disguised himself as the photographer Max sets out for his mission too. Aditya is onboard a flight with his sister, drunkard brother-in-law and his dominating mother. The political scion, even though the most important person right now, has his problem too. He is an echt politician, aspiring greatness for his country but his efforts are cut short by his mother who wants him to be precise and not promising much in his swearing-in speech. He then receives a call from WNCC reporter threatening to expose his dark secret from the night of his graduation dinner, 12 years ago and he now has to stop that from happening on the most important day of his life. The next part shows the famous photographer Max Ferrera who is on board a plane engaged in a conversation with the co passenger,a girl who is way too much interested in his profession. Max is to be the PMs personal photographer for the event and is travelling for the same reason. At this point it appears that Max is the assassin but the plot takes a spin when the girl in his next seat, actually turns out to be a member of the terrorist group that is plotting the murder.The episode ends with her killing the photographer, securing his id and jumping off the plane bombing it, leaving no evidence behind. The show’s opening visuals seem very apt and play a major role in enjoining the plot to the Indian scenario. The direction is smooth with Abhinav Deo doing a good job presenting a real time situation. The actors also seem to be doing the work just fine. Mandira Bedi looked very convincing playing CTU agent Nikita who nurtures a long lost love with Jai but is efficient at managing subordinates and her work well. However I felt the dialogues needed a little work, there were instances where it felt like the dialogues had been simply translated and didn’t fit so well. The political family bears obvious resemblance to the real political situation of the country but it lends a sense of credibility to the show. The first episode started very slow, but it picked up pace in the second half and the next episode looks very exciting. In all the show looks good, it is a nice change from the kind of shows Indian audiences are used to. The genre as such is not new, we have had CID from the same for so long now but this one is different in terms of concept and has an altogether new style of direction as its highlight. It will mostly be attracting the young audience and has all the elements to keep them captured. 24 is an Indian television drama series based on the American series of the same name. The Hindi language show is written by Rensil D'Silva, Bhavani Iyer & Priya Pinto, directed by Abhinay Deo and produced by Anil Kapoor Films. The show premiered on the Viacom co-owned Colors channel on 4th October 2013. 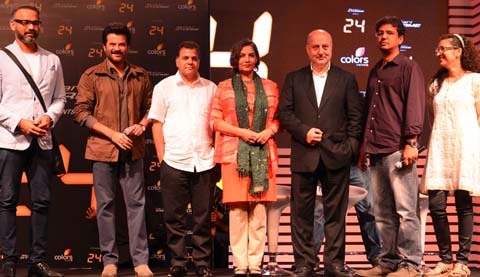 The Hindi version of 24 is the first ever adaptation of the show, the India rights for which were acquired from Fox and 24 producer Howard Gordon by Anil Kapoor Films Popular Bollywood actor Anil Kapoor plays the lead role (similar to Jack Bauer) in the show. Kapoor was previously featured in the 24 series playing President Omar Hassan.The show is set in Mumbai (Bombay) and it is known that the main set of the Anti-Terrorist Unit (ATU) is a replica of the one in the original series. 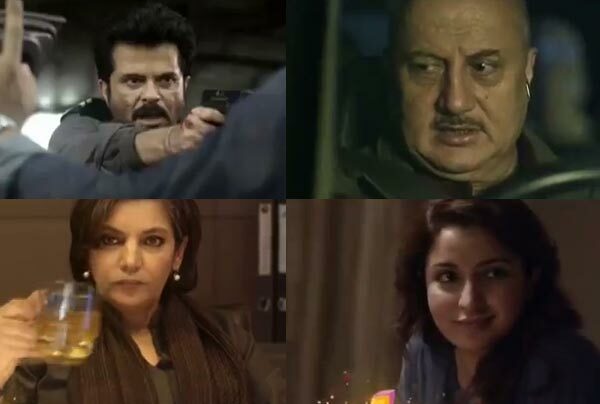 Veteran Bollywood actor Anupam Kher and actress Shabana Azmi both make cameo performances in the show.Mandira Bedi plays the character named Nikita Rai which resembles Nina Myers's character from the original show. The first season is directed by Abhinay Deo, known for his black comedy film Delhi Belly, written by Rensil D'Silva (the writer of films such as Rang De Basanti, Kurbaan and Aks) and Bhavani Iyer (writer of Black, Guzaarish, Lootera) and is supervised by Manisha Sharma. Canadian actor Kiefer Sutherland, who starred in the original show has also shown interest in acting in the Hindi version. The Indian adaptation of '24', retains all the elements of the international series, the real-time, pulse-pounding, fast-paced format with split screens and complex interweaving storylines, with 24 episodes capturing 24 hours. The premiere episode will follow the exploits of heroic Anti Terrorist Unit agent Jai Singh Rathod played by Anil Kapoor. Racing against time with the clock ticking, Jai Singh Rathod, is suddenly thrust into a chaotic and exhausting 24 hour marathon, of death, deceit, terror as he struggles to prevent the assassination of prime ministerial candidate Aditya Singhania. According to Kapoor, the series, which will be "related to the Indian ethos", will follow an Anti-Terrorist Unit (ATU), similar to the Counter Terrorism (CTU) Unit in the original series. Tisca Chopra as Trisha Rathod, Jai Singh Rathod's wife, based on the character Teri Bauer. Anupam Kher as Wasim Khan (Guest Appearance), a Research and Analysis Wing officer-in the series. Mandira Bedi as Nikita Rai, a government agent at ATU, which is based on the character Nina Myers, essayed by US actress Sarah Clarke in the original show. Neil Bhoopalam as Aditya Singhania, a Prime-Ministerial candidate and a youth icon whose life is in danger. Shivani Tanksale as Divya Singhania, sister of Prime-Ministerial candidate Aditya Singhania. Anita Raaj as Naina Singhania, mother of Prime-Ministerial candidate Aditya Singhania. Shabana Azmi as Abhilasha Grewal, an officer who takes over ATU when Jai Singh Rathod goes missing. Yuri Suri- Yuri will be playing the character Gill, a senior Research and Analysis Wing officer who takes control of the ATU. The character played by Xander Berkeley in the original series. Pooja Ruparel Ruparel will be playing the character of an aide to a minister. Adhir Bhatt as Tejpal Singh, second in command at ATU, a character based on Tony Almeida in the original series. Ajinkya Deo as Jahnvi's father. Sapna Pabbi as Kiran Rathod, Jay Singh Rathod's teenage daughter, the character played by Elisha Cuthbert in the original series. Adish Khanna as Veer Singh Rathod, Jay and Trisha's son. Filming started in February 2013 in Mumbai, mainly in actual city locations. Some scenes will include hundreds of thousands of people. The first episode aired on 4th October 2013. The show was described by the media as "one of India's most ambitious TV shows". It is one of the most expensive TV shows ever produced in India and the first to have a Bollywood star in the lead.